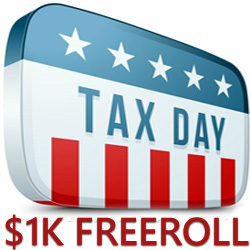 To help with the pain of paying income tax on America's Tax Day next week, Intertops Poker and Juicy Stakes Casino are holding a $1000 Tax Day Freeroll this Tuesday, April 17. Not just anyone can join this tournament. A four-part access code will be required to register for the event. Parts of this code will be sent out via the casinos' newsletters. Other parts will be published on their social media pages. If you are not already signed up to receive the poker rooms' newsletters, you should contact Customer Support to be added to the email list. All players should follow the poker room on Facebook, Twitter and Instagram. "Paying taxes is never fun so this year we decided to give everyone something to take their mind off it," said Intertops Poker's manager. "Instead of being grumpy the day you pay your taxes you can look forward to a mega freeroll. Pay nothing to enter, maybe win $1000!" Four-part password required to register. Further information is available at Intertops Poker at https://poker.intertops.eu/en/promo/101-tax-day-freeroll and at Juicy Stakes at https://www.juicystakes.eu/promotions/pkpromotions/1k-gtd-tax-day-freeroll.